The official table of the 2001-2011 U.S. Open and U.S. National Championships. One piece fold and roll design that is perfect for those with minimal storage space and easy enough for one person to maneuver. The Centrefold 25 was also chosen as the official table of the 1996 Disabled European Championships, as the legs are placed 400mm inward which complies with the ITTC ruling for wheelchair competitors. A 1" scratch-proof top that offers the most consistent bounce in our line. The top is protected by a hard PVC band and strong two inch steel rim. Steel frame with adjustable feet for leveling the table. The Competition 25 Rollaway is sure to be a hit for clubs and institutions. This more affordable 1" top and sturdy steel frame make world-class play economical. This is the most affordable 1" top we've ever offered! 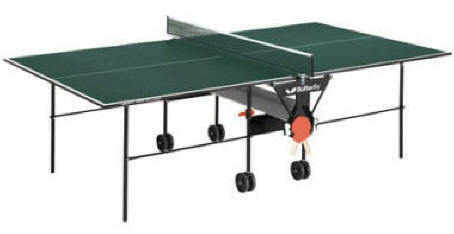 Includes net set and adjustable feet for leveling the table. Safety beam prevents children from climbing between halves during playback and storage positions. The official table of the 2001-2011 U.S. Open and U.S. National Championships and many international events such as the European and World Championships. The Europa is a simple two piece design featuring a 1" scratch-proof top that offers the most consistent bounce in our line. PVC edge banding, 2" metal rail, and sturdy 2" wooden legs. Two 5" wheels easily mount onto each table half for transporting. Requires only six inches for storage, the most compact in our line. Open the box, pull out the legs, put on the net and you're ready to play. 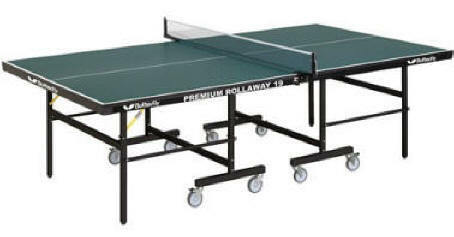 Our opening price-point Butterfly table, the Home Rollaway features a 3/4" top which is thicker than most comparable tables in this price range. 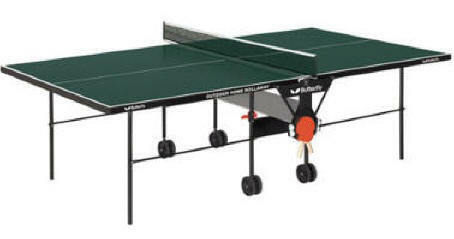 The 1" round indented legs allow for unhindered play. Two safety levers on each table side provide an effective child safety feature. Easily folds into playback and storage positions without having to remove the net. Accessory holder offers excellent storage for your rackets and balls. * Racket and balls not included. Martin Kilpatrick's first ever table requires no assembly! ½" top that provides a quality bounce for home use. Two 3" wheels are mounted to each half allowing you to store the table when necessary. The legs are indented from the ends and sides of the table for unhindered footwork. Metal latches beneath the table surface allows you to connect both halves. Open the box, pull out the legs, put on the net and you're ready to play! 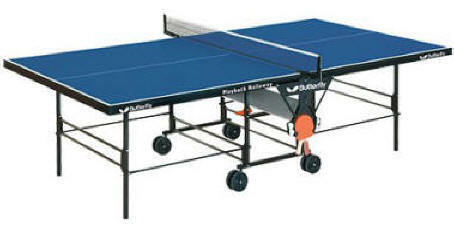 The only table tennis table you will ever need. If you have to set-up and breakdown when you want to play, the Nippon can take the abuse. The 22mm top will provide a quality bounce year after year. Easily folds and rolls due to the large 5" ball bearing wheels. Supported by 2" square wooden legs for a classic finish. Built like a tank and in it for the long haul! The Outdoor Home Rollaway’s synthetic laminate top is ideal for poolside areas, patios, lawns or any outdoor space where you can put a table. Two safety levers on each table side provide an effective child safety feature. Net & posts are included and designed so players can fold table into playback or storage position without removing the net set. Legs are indented from the ends and sides of table. German crafted steel frame that is light weight for easy mobility during storage. Finally, a durable outdoor table. The Outdoor Playback Rollaway has the same SLT (Synthetic Laminate Top) as the Outdoor Home Rollaway, but sits on the Team Rollaway frame. This results in a frame that can put up with even more abuse than the regular Outdoor Home. This model has the same safety levers on each table half for effective child safety. Net and posts are included and can remain attached to the table in both the playback and storage positions. Legs are indented from the ends and sides of the table. The Personal Rollaway from Butterfly is perhaps the greatest value in the line of playback tables. The large 5" double wheels, partnered with the side beams and 1 1/2" steel rim, provide for the highest level of performance in this price-range. An economical choice ideal for schools, recreation centers, sports clubs or heavy-duty home use. 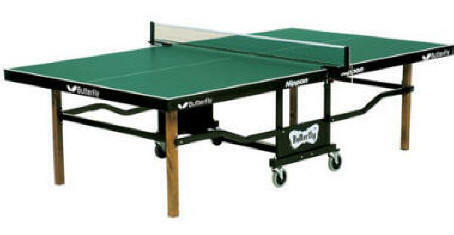 Combines a durable steel frame with a beautiful wood finish to ensure years of enjoyable play. An economical choice ideal for schools, recreation centers, sports clubs or heavy-duty home use. 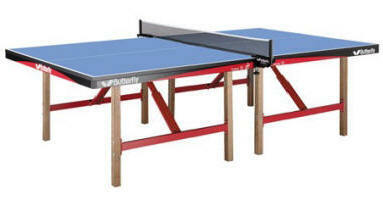 Combines a durable steel frame with a beautiful wood finish to ensure years of enjoyable play. The legs are indented from the ends and sides of the table for unhindered footwork. Two safety levers on each table side provide an effective child safety feature. Designed so players can fold-up table into playback or storage position without removing the net. A heavier Butterfly institutional table, the Premium Rollaway is well suited for schools, recreation centers, and sports clubs where durability and storage space are a prime concern. Each table half folds up separately and can be rolled to fit flush against the other half during storage. This design really saves space when multiple tables are stored together due to their ability to overlap each other. The legs are indented from the ends and sides of the table for unhindered footwork. The German crafted steel frame and lovely wood finish combine for years of satisfaction. The Space Saver 22 Rollaway features a similar construction to the Centrefold 25 Rollaway with a lighter frame. The one piece design is easy enough for one person to handle and provides for effortless set-up and breakdown. The 22mm top is protected by a PVC band and strong metal edge rail. Legs can be adjusted to level the table, even when the floor is not. Great for club or institutions looking for a fold & roll preassembled table that takes up minimal space.